This is an acrylic three tier slatwall card rack. Each tier has a deep front lip that ensures that your displayed merchandise will stay securely in place. The multiple tier design allows you to easily organize the products that you have. A tiered design is also optimal for your customer as it makes the browsing experience easier. The slatwall attachment makes this display extremely easy to install. This rack is ideal for displaying many types of media such as books, DVDs, greeting cards and software. Available in open or closed ended styles in 4 sizes. Also available with a 20 degree tilt number. Choose from the options below. 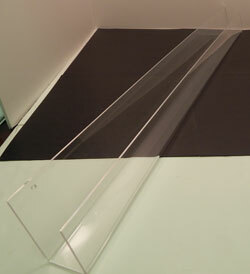 Wallmount card rack display constructed of clear acrylic. 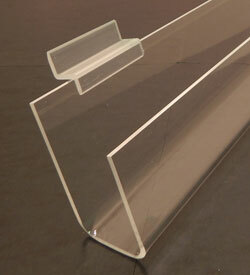 Available in 4 sizes, choose from open or closed ended card racks. This card display is about 1 3/4" deep. This rack features a downward slope, great for displaying cards, books or media. The 4' version will be slightly bowed. This happens when heating, bending, and cooling long pieces of acrylic - The longer the piece, the more pronounced the bowing. If you would like to avoid the slight bowing, please order shorter lengths. Doubling up lengths of the 2' pieces is probably the best option.